Enjoy our 3-in-1 mobile dispensing dolly which holds 210-litre drums easily. 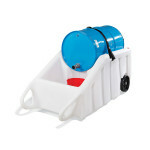 The PIG® Mobile Dispensing Dolly is used to transport drums, create a portable dispensing unit, and act as secondary containment to prevent leaks and spills from hitting the floor. Like our Decks and Pallets, the Dolly is an indispensable tool for battling leaks and spills.